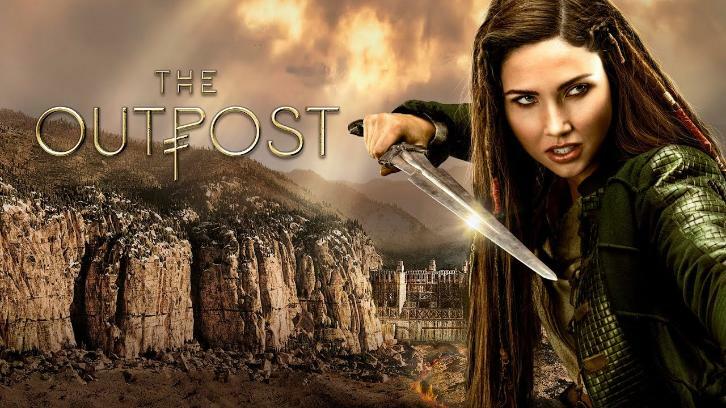 The Outpost is pushing hard in the last half of the season delivering heart-pounding fight scenes and amazing twists. This episode changed a lot of things and sent characters on unexpected trajectories. Every character is changing and evolving before the audience and that is a great thing to see. During the first season of a show writers far too often forget to keep pushing the characters to evolve. That is not a problem with this show. These writers push the characters hard and the performers even harder forcing them to keep evolving and changing and growing. Gwynn has really been on a major character growth arc. In the prior episode where she announced to the group that she is the last of the royal blood and therefore the Queen of the resistance. That sparked something in her and she really took a stand and took charge of things at the outpost. When her handmaid’s body was discovered she immediately, and rightfully, blamed Wythers. Without hesitation or doubt she sentenced him and had him sent to the mines for his crimes. But she did show a bit of leniency for Garrett’s sake and didn’t have Wythers killed as the Commander would have liked. She had some very nice moments with the Commander where their relationship was fully fleshed out. He does indeed love her like a daughter, but he respects her as his Queen. What she wants is what he orders on her behalf. Her leadership was on full display throughout the entire hour. Her merits as a leader were on full display when she showed a group of rogue resistance soldier’s mercy. When the group tried to defect to warn the Prime Order, Gwynn had only the leader of the group executed and allowed the others to go free. She clearly hated it, but she did what she had to do, as a leader. To succeed she knows they will need Garrett’s rebel army fully loyal to her and what she did by showing mercy helped to solidify the loyalty of those that remain. In the gifted hands of Imogen Waterhouse and these writers, Gwynn has gone from a bit of a spoiled brat to a full-on powerful leader, worthy of respect. With her at the helm they may just have a chance at defeating the Prime Order, but it won’t be easy. Garrett was on his own journey in this episode. He was challenged in many ways and had to make some very tough choices. The love between him and Gwynn is as strong as ever. He’d do anything for her, but he is still a son who in some distant part of his heart still loves his father. The son within him wanted so badly to believe that his father wasn’t capable of such a horrible crime, as he argued in his father’s behalf. If he does learn the truth, that his father did indeed kill Lily it will be interesting to see how that changes his view on his dad. They already have a tenuous relationship at best. His loyalty to Gwynn showed when he did as she ordered and left her to deal with his father. Unfortunately, by leaving, he was put in a life-threatening situation as he was at the rogue camp when danger arose. The plaguelings turned and broke from their confines, putting Garrett in great peril after he was stung by one of them during the escape. It is interesting that he didn’t go to anyone for help. The episode closed out with Garrett chaining himself up in an attempt to spare the others from being infected by him. Unfortunately for him, both Talon and Janzo, his best hope for help, were out on their own journey during all of this. There is a big question mark regarding him now as the episode closed out with him looking very ill.
Jake Stormoen was incredible in this episode as his character dealt with a great deal. Stormoen didn’t miss a single beat as he took Garrett through it all. As soon as Garret was stung he started showing the effect it was having on him. There have been a lot of great acting moments for Stormoen, but this was some really great material for him and he truly nailed it. Given where the episode ended there are likely to be some even more powerful moments ahead for Stormoen as he takes Garrett through the effects of the sting and what that will ultimately mean for him. He is poised to break some hearts as Garrett struggles to survive. The best chance Garret has now is for Talon to quickly get Janzo back to the outpost alive. The problem with that is that Talon herself is a target of various sinister beings. The ominous warning she got from the demon realm doesn’t bode well for her or her friends that need her. Not to mention, despite all of Janzo’s amazing qualities, he is also a bit naive to the world and doesn’t make it easy for Talon to keep him alive. So, not only is Talon having to watch her own back, but she also had to keep Janzo from blindly getting himself into trouble via any number of dangerous foes that live in the woods. During the colipsum trade, it was Talon’s cunning intuition that kept them from falling into a trap. Interestingly enough, the colipsum dealers are Grey Skins. Prompting Janzo and Talon to wonder why Grey Skins are selling colipsum to humans. It is indeed a perplexing question. The answer to this question is likely to be one with sinister intent. That will definitely be an interesting storyline to see further fleshed out in the last episodes of the season. The good thing is they survived the encounter and got enough colipsum to keep the Mistress happy for a while. Now the duo has to survive the trek back home. It will be nice to see Janzo and Talon return to the outpost, but their adventure together really helped to showcase the pure chemistry between Jessica Green and Anand Desai-Barochia. Their innate bond has been evident since the start, but this whole adventure for Talon and Janzo has really allowed these two performers to dive deeper into the bond between the characters. Janzo annoys Talon at times, but she doesn’t just tolerate him, she cares about him. They are each doing the other a favor on this journey, but they are both in it for more than that. Even if this hadn’t come up then, Talon would still be looking after Janzo’s wellbeing and he’d still be eager to help her. There is more to what they feel for one another than Talon is willing to admit yet. Janzo, on the other hand, is not the least bit shy regarding his feelings for her. It is this push and pull that Green and Desai-Barochia play so well that makes this duo so compelling to watch together. When they discovered Talon’s shoulder was dislocated Janzo was so tender with her despite the fact she was in pain and less than tolerant at that moment. After her shoulder was fixed, Talon looked back at him with great admiration and respect. She soon had to get back into protector mode and then fighter mode, doing her best to keep Janzo out of danger. Later when they were attacked by the Bone Wolf they fought as a unified team. Janzo was scared, but as soon as he saw Talon was in peril he set aside his fear and stepped up and showed how much power comes from caring for someone. It was their united front that got them through that attack. The way they complete one another adds to their dynamic. What one lacks, the other has in abundance. Garrett and Talon would be a great pairing, but there feels like there is a more natural connection between Talon and Janzo. It will be interesting to see which direction the writers take with these characters. While all of this was going on, Wythers was in the mine serving the time he was sentenced to by Gwynn. Unfortunately for him, he was not eagerly welcomed by the other prisoners, many of whom he sent to their fate in the mine. Luckily for him, the Mistress sent him help, but the mine is not a place where he will survive long. However, it seems likely that in due time Wythers will make it out of his confines. When the time comes, it will be interesting to see if he sells Gwynn out to the Prime Order or if he remains loyal to her for the sake of his son. Given how duplicitous he is, it is really anyone’s guess where his loyalty will ultimately fall. With Dred and his army marching towards the outpost the odds are good his loyalty will fall to whoever provides the most benefit to him. It is a true testament to Andrew Howard that Wythers is such an intriguing character. One episode it is easy to sympathize with him and the next it is so easy to hate him. Howard perfectly plays the storyline the writers have laid out for Wythers. He isn’t a big bad, but he’s also not a good guy. He is a wild card and sometimes those characters are some of the most fun to watch. In the wake of Wythers being stripped of his title and thrown in the mines, a new Gate Marshal had to be named. The one who took over is incompetent at best. Currently, of the eligible candidates for the job, Gwynn would be wise to take a hard look at Danno. He knows her secret and seems very respectful of her title and is loyal to her. He knows all the ins and outs of the job from his time working with Wythers. He may be a man of no words, but he would make one hell of a good marshal. That is, if he doesn’t do anything stupid to try to help Wythers. He could be the best candidate for the job and perhaps even better than his predecessor. A lot went down in this action-packed episode. It was full of great character moments, that also set up a lot of things to come. With only three episodes left in the season and a lot of things to cover in the story, these next episodes are full of promise. Many different foes are headed towards the outpost with the intent of stoping the Blackblood Prophecy and squashing the rebellion. The season looks poised to end with some very strong episodes. This show truly filled a void that has been absent from the television landscape. Don't miss the next episode when it airs on Tuesday, September 11th at 9/8c on CW. Hit the comments with your thoughts on the episode. Was Gwynn fair with Wythers and the rogue soldiers? Will Talon and Janzo make it back in time to help save Garrett? Why are the Grey Skins involved with colipsum?